Last year, Created Equal launched Project Weak Link. This campaign focuses on corporations that, while they do not kill unborn children directly, enable the killing by contracting with abortion businesses. Sometimes, contractors don't realize that they are enabling violence, and it's a simple matter of education. For instance, earlier this year, a Wichita abortion facility lied to roofers about the nature of the building they were working on; when pro-life advocates informed the roofing company of the deception, the roofers exercised their consciences and walked off the job. One of the leaked CMP videos featured abortionists commiserating about a perplexing administrative problem: if you can't sell the corpses, how else to dispose of them? Created Equal has jumped on this and launched a new initiative called Project Weak Link. The tissue disposal companies are the weak link in the abortion industry chain. Created Equal proposes that if tissue disposal companies realize that working with abortion businesses will bring them bad press and cost them money, the power of the market will kick in to save babies. Project Weak Link achieved a significant victory when the nationwide disposal company Stericycle cut ties with approximately 260 abortion businesses. 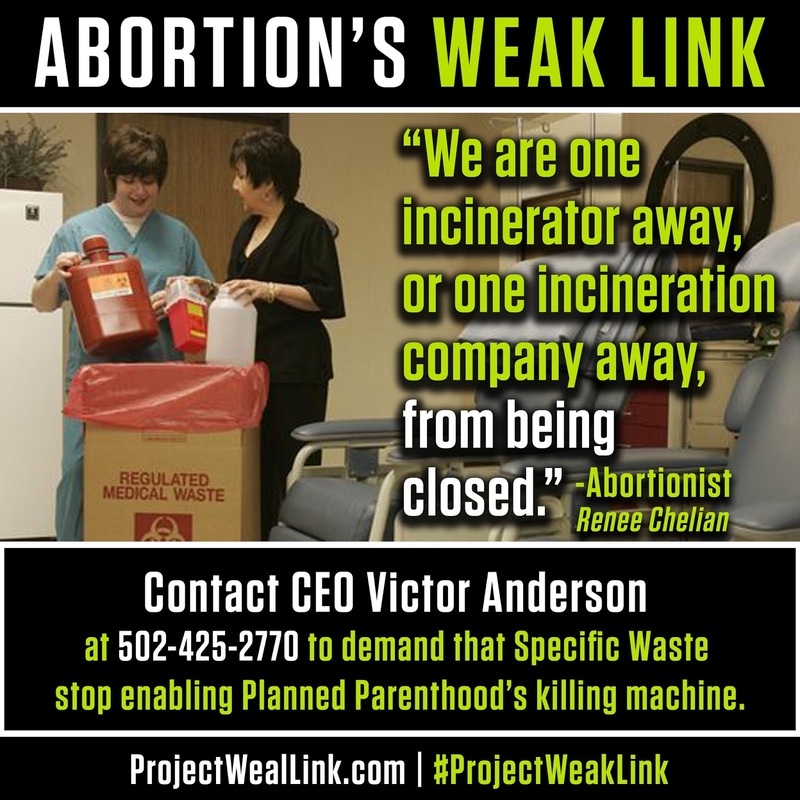 Now, Project Weak Link is shifting its focus to another company: Specific Waste Industries, a disposal corporation enabling abortion throughout the Midwest. Specific Waste Industries is particularly notorious for contracting with EMW Women's Surgical Center. EMW is the last abortion facility in Kentucky, and it encourages women to abort by giving them fake information about prenatal development. 1. Sign the petition against Specific Waste Industries. 2. 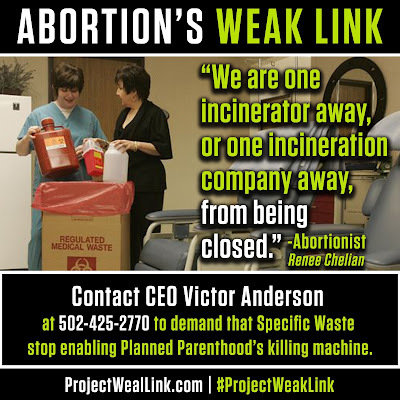 Call Specific Waste Industries CEO Victor Anderson at 502-425-2770; ask him to put humanity above profits and terminate his company's contracts with abortion vendors.